Bournemouth manager Eddie Howe says winning promotion "means the world to him" after seeing the Cherries seal their place in the Championship. And Howe, who returned to the club as manager in October, has now urged his side to win the League One title. The Cherries secured promotion to the second tier for only the second time, following their 1987 success. 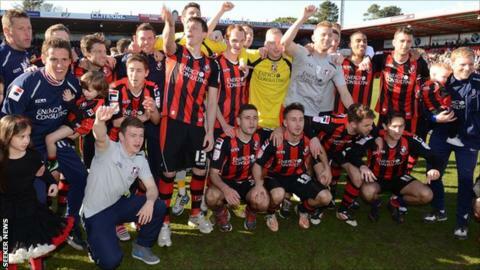 "No one is more pleased than me as a Bournemouth fan as a kid," Howe told BBC Radio Solent. "It means the world." Howe's side achieved promotion courtesy of a 3-1 victory over Carlisle and both Brentford and Sheffield United failing to win. It means they return to the second tier of English football for only the second time in their history - after they were champions of the old Third Division in 1987. Victory for Bournemouth on Saturday was also a club-record eighth successive victory. "I'm delighted for the Bournemouth people and the supporters who have stuck with this club through thick and thin," added Howe. "They have had a rough ride with financial problems and the club looking like it was on its knees." Bournemouth were in League One's relegation zone when Howe took over and the former Burnley boss admits he never believed he would achieve promotion so quickly. "It's gone better than I could have ever imagined," he said. "From the first training session I was very impressed. We set about trying to integrate the group, improve the team spirit and mentality and they deserve all the credit. It's been an unbelievable run. "I have to thank the fans because they have been patient and that really makes a difference. They have more then played their part and to achieve it at home and to see the supporters so happy means the world to me." The club can now win the title at Tranmere next weekend and Howe has urged his side to end a memorable season with some silverware. "We want to win the league and that has got to be our aim," he said. "We have to keep the lads on an even keel, they have been the most professional group I have worked with and I don't think that will change."